Kent State University online is one of 76 public higher-research universities, as categorized by the Carnegie Foundation for the Advancement of Teaching, and is ranked in the first-tier list of Best National Universities by U.S. News & World Report. 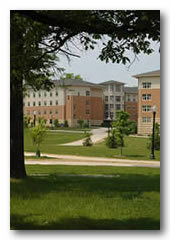 With eight campuses spanning Northeast Ohio, a College of Podiatric Medicine, a Regional Academic Center, and academic sites in major world capitals such as New York City, Geneva and Florence, Kent State is one of Ohio’s leading public universities and a major educational, economic and cultural resource far beyond the Northeast Ohio region it has served since 1910. The student body comprises nearly 41,000 students, including nearly 3,000 international students from 120 countries and the worldwide alumni family exceeds 234,000. The 100% online program is designed to prepare working public relations and communications professionals with the knowledge and ability to further their career, define their role or transition into a new leadership position. The curriculum is dynamic, challenging and professionally relevant — thanks to industry-experienced faculty. The courses address specific capabilities demanded by today’s employers—crisis management, internal communications, social media strategies, and investor relations. The curriculum consists of 12 courses - nine required courses and three elective courses. Courses include PR Management, Law for Advertising & Public Relations, PR Measurement & ROI, Crisis Communication Theory & Practice and Social Media in PR. The university is accredited by The Higher Learning Commission and is a member of the North Central Association. Kent State University celebrates diversity, encourages innovation, and empowers students to make a positive impact. Web-based courses, Blackboard video conferencing, and other technologies make online learning both engaging and effective. Distance learners benefit from online academic advising and 24/7 technical support. Kent State University is regionally accredited by the North Central Association of Colleges and Schools (30 North LaSalle, Suite 2400, Chicago, IL 60602-2504; 800-621-7440). Loans may be available. Applicants may apply by completing the Free Application for Federal Student Aid (FAFSA - 003051).